Debt is money spent in the present and an obligation to be repaid in the future. Given this, I thought I'd contrast China's population of young versus their obligation to be repaid in the future. The chart below shows the 0 to 24 year old Chinese population (green line) versus Chinese debt (red line) and GDP (black line). 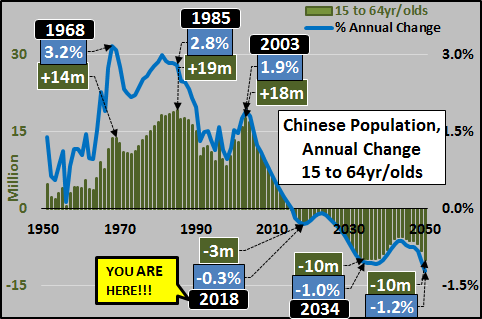 The 0 to 24 year old Chinese population swelled by over 300 million from 1950 to it's ultimate peak in 1991. Since that peak, the total population of young in China has fallen by 176 million, or a 30% decline in the number of children across China. Moving forward, the UN medium estimate hopes the formal elimination of the one child policy will simply slow the rate of decline in the population...but by no means will China's fast declining childbearing population (those aged 15-44) nor disproportionately young male population potentially be offset by a slightly less negative birth rate. Contrast that with the quantity of debt being forcibly injected into a nation that faces a massive imminent population decline. 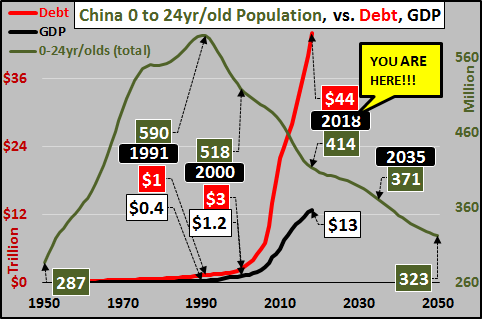 To put that debt into perspective, the chart below shows that total debt and annual GDP each divided by the 0 to 24 year old Chinese population. 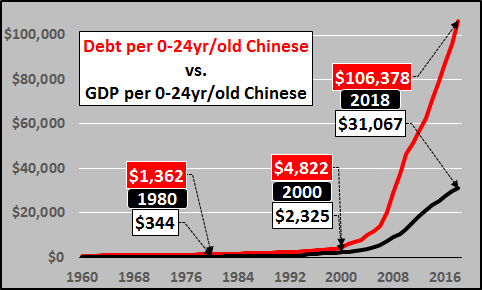 As of 2018, every child and young adult in China under the age of 25 is presently responsible for over $100 thousand dollars in debt while the annual economic activity (GDP) created by all this debt continues to lag ever faster. And the coming decade only worsens as the young population continues its unabated fall and debt creation (absent concomitant economic growth) continues soaring... building more capacity all for a population that is set to collapse?!? China's predicament and reaction to it are not particularly unique...but given China's size, the ultimate global impact of China's slow motion train wreck will be unprecedented... particularly as their 15 to 64 year old population is now in indefinite decline. Chart below shows annual change in Chinese 15 to 64 year old population, in both millions (green columns) and percentage (blue line). Massive overcapacity (thanks to over a decade of government mandated mal-investment) versus a ever swifter declining base of consumption does not add up to a burgeoning middle class or a happy ending. 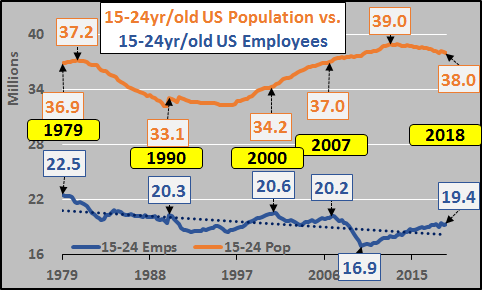 Just for comparative discussion sake, below is the US 15 to 24 year old population (orange line) and employment among them (blue line) since 1979 (the year of peak employment among 15 to 24yr/old Americans). 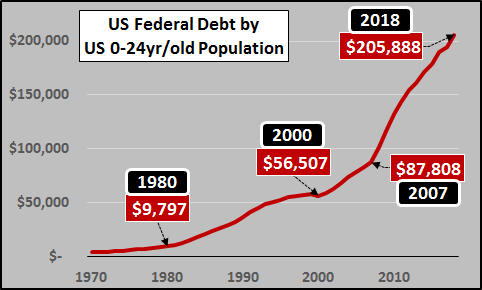 And just for fun, US federal debt per capita of the 0 to 24 year old US population (a bit unfair comparison as I'm only showing US federal debt vs. 0 to 24yr/olds against China total debt vs. 0-24yr/olds above...but you get the idea).